Hypancistrus zebra are very hard to come by these days, and they fetch high prices when available on the market. Unfortunately we see that some people try to take advantage of this situation, and sell fish at very high prices, and unfortunately, sometimes the fish aren't healthy. Here's a few things to look out for to make sure the fish you buy are healthy zebras. This article will show some of the most commonly seen deformities and illnesses we see in H. zebra, and will venture to explain the how why and what regarding the different conditions. The article is especially aimed at those that do not yet own a Zebra, but have fallen in love with the fish, and spend time and money to acquire their first Zebra. We really don't want your first acquaintance with this fish to be a disappointing one, so read through the article, and know what you want to be looking for so that you can get a long lasting and happy relationship with this beautiful fish. Notice that the fish has a rather long nose. It's got a bluish tint in his eyes - Unfortunately the bluish tint in the eyes are very hard to capture on picture, but it should be easy to spot when looking at the fish), which sits relatively high on the head, almost like buttons. A healthy Zebra has a bluish tint to it's caudal and tail fins. There's no red spots or lesions on the skin, the fins should not be frayed, and the tail has a pronounced V-shape. Look at the fishes tummy, it should be round, showing that the fish is eating well and don't have any internal ailments. When looking at the fish from above, you'll see that all the fins are regularly shaped and of the same length. The fins are well developed, and about the same length or longer than the fish's head. The adult H. zebra will have a body - looking at the area just behind the pectoral fins) that is as wide, or wider, than the width of the head. Younger fish will often have a more narrow body, but if it does, then make sure you get to see the fish' tummy, to check for malnutrition. If the tummy is full and round then normally all should be well. However, all is not always well with fishes offered for sale. Here are some things to look out for. The water is too hard, too high alkalinity. This in turn affects the egg shells and forces the fry to stay longer in the egg than they're supposed to, and makes it harder to get out of the egg. Only time will tell what causes this deformity. Even though the fish can and will live a long life, apparently not being bothered or affected in any way by this deformity. More recently, it has been shown that breeding snubnoses can produce 100% normal offspring, indicating that snub noses are caused by environmental factors and not genetics. Some may still argue that it's impossible to tell if it's genetic or environmental damage - but they do not have the benefit of fact. There's a long discussion on the forum concerning this deformity, the thread can be found here. If the fish you plan to buy has this deformity we advise you not to buy it if you plan to try and breed the fish. If you're looking for a "pet" the fish will probably still give you joy for years to come, but remember - it does have a deformity, which should be reflected in the price you pay for it, and you do have a responsibility of passing this information on should you decide at some point to sell the fish. The zebra is usually a very peaceful fish, but they are able to fight quite fiercely for their territory or their position in the hierarchy. The picture shows a male that was beaten up by the alpha male in the colony. This fish was restored to previous health by an experienced aquarist, but the wounds could have been fatal. Treat with frequent water changes, and an antibacterial agent. It's interesting to note that the fish developed a different pattern on his tail as he healed. A fish with damaged fins from fighting or fin nipping from tankmates they shouldn't be kept together with will look quite different. This will heal without too much trouble given the right conditions. Clean water and correct feeding, in a tank with suitable tankmates is all it takes to heal this kind of damage. A captive bred zebra can, if not given optimal condition, end up with underdeveloped fins. The fish on the picture has no pelvic fins, a round tail fin, and very short pectoral fins. The fish on the picture has not been given optimal growing conditions and is seriously underdeveloped. This is a permanent damage. From this angle one can see even more clearly that this is a severely underdeveloped fish. It's about two years old, but has all the characteristics of a fry. Only when seen from above one can tell it's an adult fish due to the width of the head. The dorsal fin can clearly be seen as severely underdeveloped as well. Do not buy a fish that looks like this, or show any signs of stunted growth. Always ask how old the fish is before you buy, and make sure the fish has developed according to its age. This fish is so severely undernourished that not only the tummy is sunken - the back of the fish is sunken as well. One can clearly see that this fish has a head much wider than the body, and that it is an adult. The fish also has under developed fins. Never buy a fish with a sunken belly, it should be round and full. The muscle tone should clearly show that the fish is well fed. If the fish has an extremely sunken belly, it could have permanent internal damage, and be beyond salvation. Under developed Undernourished A mature and healthy male! This picture shows a condition that is infectious and appears to be either viral or bacterial in origin. It appears that the pathogen responsible causes normal cells to mutate and form the growths, I suspect the growths to be some sort of sarcoma. It looks like the only effective treatment is to physically remove these tumours, and treat the affected area with iodine, as soon as possible to prevent cross infection. This fish has a a dermal/intra muscular growth that is benign. No treatment is necessary in this case, as the growth doesn't get any bigger, and doesn't seem to affect the fish at all. No action is needed, but look out for them when buying a fish nonetheless. Fungal diseases and infections are one of the most common ailments an aquarist has to treat. With the zebra pleco it's most common form appears to be brought about by territorial disputes. Despite being a relatively timid fish, the zebra pleco will defend its territory from other zebras with great vigour, often resulting in injury or in some cases the death of a fish. In normal conditions the zebra - and other fish) are protected by a mucus that covers the skin of the healthy fish. After territorial disputes or spawning activity however it is often common to see a reddening of the pelvic fins and areas around the vent. Although in itself this is not a major worry it can lead to further complications in the form of fungal growth. Any "break" of rupture in the protective mucus, exposing damaged flesh will provide an area for the infectious spores - which are naturally abundant in most aquarium) to form a foothold and form fungal infections. As you can see from the picture, an otherwise healthy female has been in a territorial dispute resulting in a damaged pectoral fin. Despite starting off as slight dispute, resulting in a reddened fin tip, the territorial fight increased until the injury removed all flesh from the tip of the fin. This area, then became susceptible to fungal infection which , can be seen as cotton wool like strands. If caught early enough, fungal infections can be treated relatively easily with a suitably applied Methyl Blue solution. - This should only be done if the fungus is clearly visible). It can often be easier to catch the fish and place it in a breeder hanging inside the tank. Then using a clean cotton bud, dabbed Methyl blue, gently dab the affected area. It is also important however to ensure excellent water quality to reduce the chance of the infection increasing. If left to progress a fungal infection will kill the fish within a matter of days. The best way of making sure this does not happen is undoubtedly prevention. The majority of fungal infections occur due to tank disputes. Therefore by making sure that there are sufficient areas for fish to hide and form territories the risk of such infections should be kept to a minimum. Lesions can be caused by many variables within a tank, ranging from heater burn, to bacterial infections. It is often difficult to identify the reasons for a lesion due to the fact that they are often a symptom of another ailment. We are doing further investigation into this area for provide more information on this section. Ich is a well known parasitic disease in the aquarium hobby. 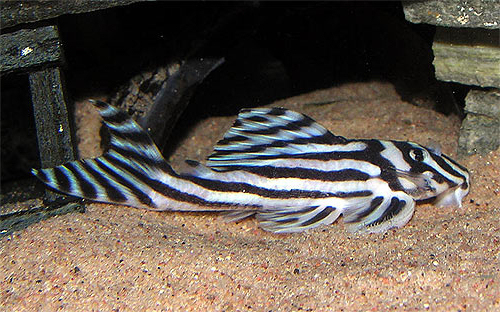 Zebras can, like other aquarium fish, be infected by this disease. Fortunately there are efficient and easy ways to cure this disease. Read first hand experiences with how to deal with this disease in this forum thread. Pictures copyright of Du ma, Adam, Rob, Mindy, McEve, Barbie, wandj, Caesars and anonymous respectively.